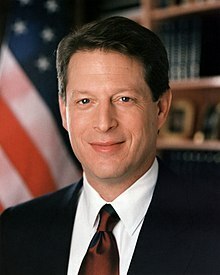 Albert Arnold "Al" Gore, Jr. (born March 31, 1948) is a former American politician. He was the Vice President of the United States under Bill Clinton from 1993 to 2001. Before that, he was a Senator for Tennessee and a congressman. He is a Democrat. He was chosen as the Democratic nominee of the 2000 United States Presidential election, but lost the electoral vote to Republican candidate George W. Bush because of Florida and the US Supreme Court ruling a 5-4 favor of Bush. Gore won the popular vote. When Gore lost the presidency, many people were against the Supreme Court argued that it was the only time in history that the Supreme Court chose the next President. Gore won the Nobel Peace Prize in 2007. Albert Gore, Jr. was born in Washington, D.C.. He is the second of two chidren. His father, Albert Gore, Sr. was a Senator for Tennessee and congressman. His mother, Pauline LaFon Gore is one of the first women to have graduated from Vanderbilt University Law School. Gore is descended from Scots-Irish immigrants who first settled in Virginia in the mid-17th-century, and moved to Tennessee after the Revolutionary War. Gore was brought up in both Washington and Tennessee. His older sister was Nancy LaFon Gore, who was born in 1938, died of lung cancer in 1984. Gore was a Representative from 1977 to 1985 and a Senator from 1985 to 1993. In 1988 he ran for President for first time, but lost to Michael Dukakis in the Democratic primary. In 1993, he became Vice President to Bill Clinton. He ran for President in 2000, but lost to George W. Bush (many people still argue this). Even though he lost the race, Gore won in the popular vote by over 500,000 votes. Gore is now a businessman, and runs and works for several companies, including Generation Investment Management, Google, Apple Computers, and TV channel Current. He is also a fighter for issues involving the environment. He released a movie in 2006 about global warming and climate change called An Inconvenient Truth, which was based on a slide show he had given to millions of people. In 2007, Gore won the Nobel Peace Prize which he shared with the Intergovernmental Panel on Climate Change. Interest in having Gore run for the 2016 Presidential election arose in 2014 and again in 2015, though Gore has not declared an intention to run. He currently lives in Nashville and was married to Tipper for 40 years. In June 2010, they filed for divorce. The Gores have 4 children and 2 grandchildren. ↑ Supreme Court of the US (December 12, 2000). "George W. Bush, et al., Petitioners v. Albert Gore, Jr., et al., 531 U.S. 98 (2000)". Cornell Law School. Retrieved March 17, 2013. ↑ Klarman, Michael J. (December 2001). "Bush v. Gore Through the Lens of Constitutional History". California Law Review (California Law Review) 89, No. 6 (6): 1721–1765. ↑ "Gore Chronology". Frontline, Choice 2000. PBS. Retrieved March 17, 2013. ↑ "Al Gore 2016: Support Starting To Build For Another Presidential Run". Inquistor. July 20, 2014. ↑ Goldman, Russell (June 1, 2010). "Al, Tipper Gore Shock Friends With Divorce Announcement". ABC News. Retrieved November 11, 2011.